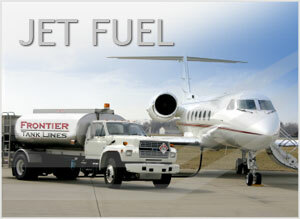 Frontier Tank Lines provides Jet Fuel as part of our Fuel offerings. Jet fuel is designed for use in aircraft powered by gas-turbine engines. The most commonly used fuels for commercial aviation are Jet A and Jet A-1 which are produced to a standardized international specification. Jet A specification fuel has been used in the United States since the 1950s and is only available in the United States, whereas Jet A-1 is the standard specification fuel used in the rest of the world. Both Jet A and Jet A-1 have a higher flash point which means that the fuel is safer to handle than traditional gas. Also used in civilian turbine-engine powered aviation is Jet B, which has a lighter composition making it more dangerous to handle. It is used almost exclusively in extremely cold weather climates. Jet Fuel, along with the other types of fuels we provide to our customers, is just a small part of the additional services we provide: Emergency Fuel, Fleet Fueling, Inventory Management, Tanks, Transportation, 24Hr On Call Dispatch Teams. If you’re in the market for Jet Fuel, we would love the opportunity to provide it for you, call us today at (800) 291-7876.